LONDON (Feb 3): Sterling fell another 0.4% on Friday after a fall in a closely-watched services sector indicator reawakened concerns over the impact of last year's Brexit vote on a previously resilient economy. The drop in the monthly index of service sector purchasing managers was its first since October and followed small drops in the construction and manufacturing equivalents earlier this week. Along with a handful of other second tier numbers on housing and sentiment, those are the first signs that consumers and companies are starting to suffer from the decision last year to leave the European Union. "It is only one weak data point but it is a top tier one. Sterling came off pretty hard yesterday and this is going to give the market confidence (to sell it further)," said Richard Cochinos, European head of G10 currency strategy at Citi in London. "Real wages are going down and you can see sentiment is softening, that is going to weaken the UK data over the next few months. Short-term we're bearish and we are going to stay that way." 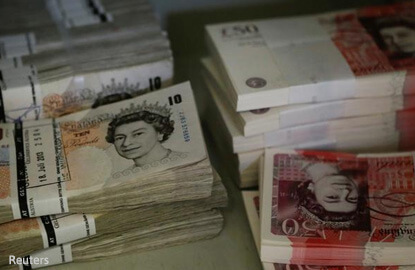 Sterling has gained almost 3% since Prime Minister Theresa May laid out the government's vision for divorce from the EU in a speech just over two weeks ago, but its 1.3% fall against a basket of currencies on Thursday was the worst since October. The fall came on the back of a Bank of England quarterly inflation report that upped growth forecasts but declined to do the same on inflation and pointed to interest rates staying on hold long into next year. "UK data has been robust and price pressures are building, but it was surely too early for markets to expect a significantly more hawkish narrative (from the bank)," analysts from Bank of America Merrill Lynch said in a note before the data. "A benign interpretation of the Brexit process and strong UK data had perhaps lulled the sterling market into a false sense of near-term security," they said. Another cautionary note on the economy came from data showing the number of new homes built in London fell 6% last year while an indicator of future supply dropped by a third. The gains for sterling seem largely to reflect investors cashing in the big negative bets taken on the pound after Britain voted to leave the European Union last June. That has provoked a number of major banks to call for the pound to recover to around US$1.30 in the months ahead, even if most admit such forecasts are heavily exposed to the political noise surrounding talks due to be launched by late March.